The Pizza Game is a Lean simulation created by Bob Petruska using poker chips and train tracks to illustrate the concepts of lean and kanban, with a focus on Value Stream Mapping. Using poker chips and wooden train tracks, the materials are a bit more unorthodox than some other simulations. 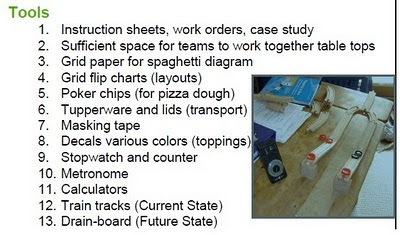 During the game, the group makes pizzas with six linked processes and an inspection. Other Lean disciples are involved in timing and tracking the results. 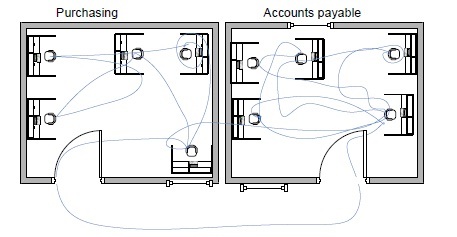 Some of the tools discussed include work balancing and spaghetti diagrams. 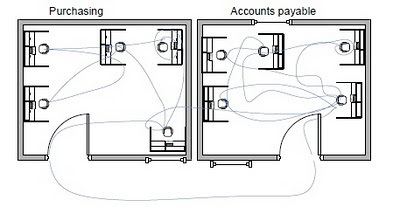 Each iteration of the game is followed by a kaizen blitz, where the team uses VSM to map the processes and improve it, by combining operations, changing the layout and developing a pull system. The Pizza Game is a complete simulation, with all information required to run it included in the .pdf. You only need to acquire the materials. The simulation can be found on the 2009 ASQ Lean Six Sigma conference website, close to the bottom of the page. 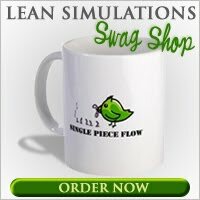 There is plenty of other great Lean information on the site, including articles on A3 thinking, kaizen blitz, continuous improvement, lean automation and much more. Hi Bob! Thanks for commenting on this page and thanks for creating this game! I've seen lego and paper folding used for lean games, but this is the first one I've seen using wooden train tracks to simulate a pizza line. Very cool idea! I've update the original heading with a link to your site.